I put together this first outfit inspired by the lookbook I made last fall. I knew that wearing a faux leather jacket indoors would be too hot, especially while teaching, so I needed an option I could wear more easily. I found this black blouse that I felt needed a bit more wear and felt it went well with the overall look. The blouse has a Victoriana style with a high, ruched neckline and cuffs, it is sheer and therefore contrasts nicely with the sturdy boots, while still giving the skirt center stage. Since it was still wet and windy, my Dr. Marten’s collection got a good deal of wear these past few weeks. This outfit is an oldie but a goodie. I have had this cardigan for nearly a decade (!!) but I still love it till this day. Just goes to show that spending a bit more on an item can pay off in the end. The dress is also an old find. 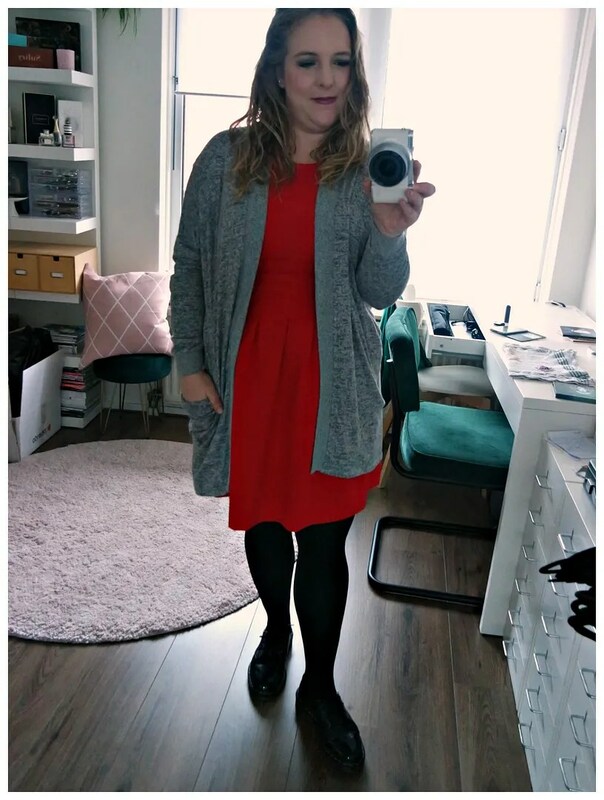 It is one of my only grey dresses and I love wearing it in the fall/ winter time and I figured I hadn’t worn it yet. I love the burgundy and grey together: it looks really good together. I am loving this third outfit. 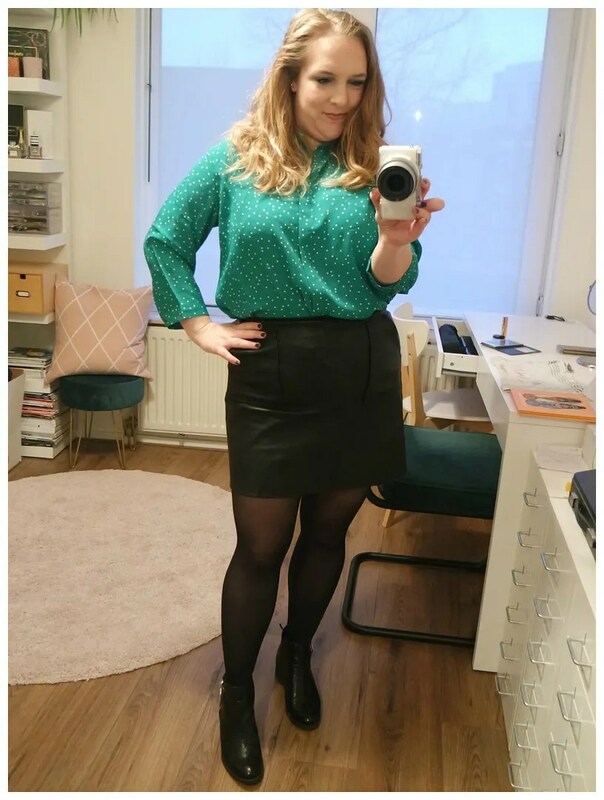 I am totally into green at the moment and this shirt was one I found in the winter sale. I didn’t buy too many clothes in the sales, but I made an exception for this. 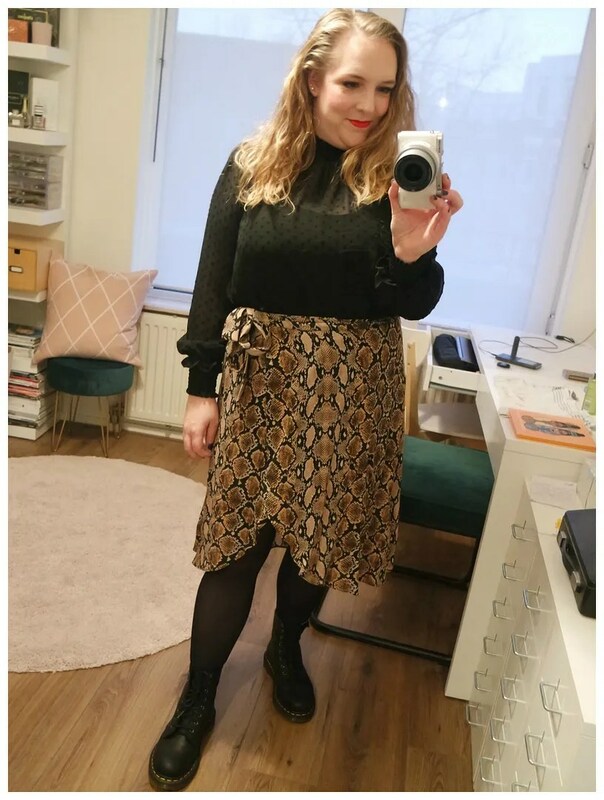 It is a polka dot number (one of my favorite patterns) and I decided to pair it with a faux leather skirt that I love. I think this is one of the most successful outfit combinations I made these past few weeks. This is a very recent outfit. I wore this just last Monday. I wanted to be comfy after a busy weekend and this was just the outfit for that occasion. 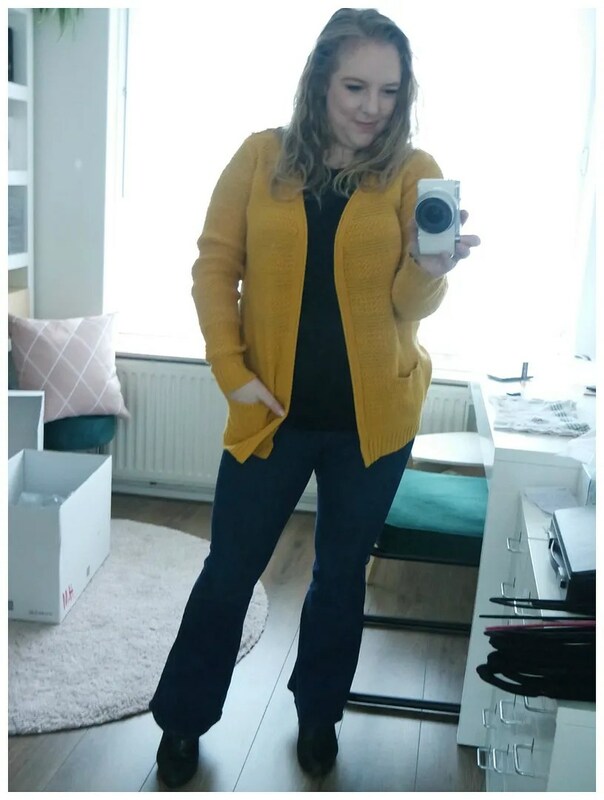 I love mustard yellow and this cardigan is the best example of a mustard yellow item in my wardrobe. I kept the rest of the outfit nice and basic to make the yellow pop and to not take away from that flared bottom. Even one of my male colleagues complimented me on these flared jeans. They are hard to find if you are vertically challenged like me, but these fit perfectly. I love red, but I felt I hadn’t been wearing the color much lately. This outfit changed just that. I love this dress as it is quite thick and therefore perfect for the colder weather. It is sleeveless, so I love throwing a cardigan on top. 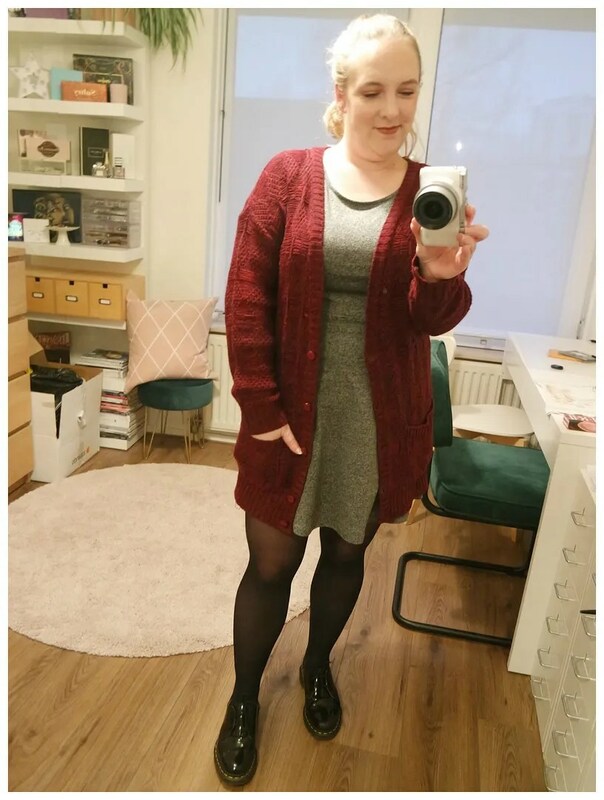 I know not everyone loves cardigans, but this is a very me outfit. Just give a good dress, a comfy cardigan and a cool pair of boots and I’m out the door. This dress is again old as well as the cardigan. I have had both items for years. This final outfit is a bit of a compromise. 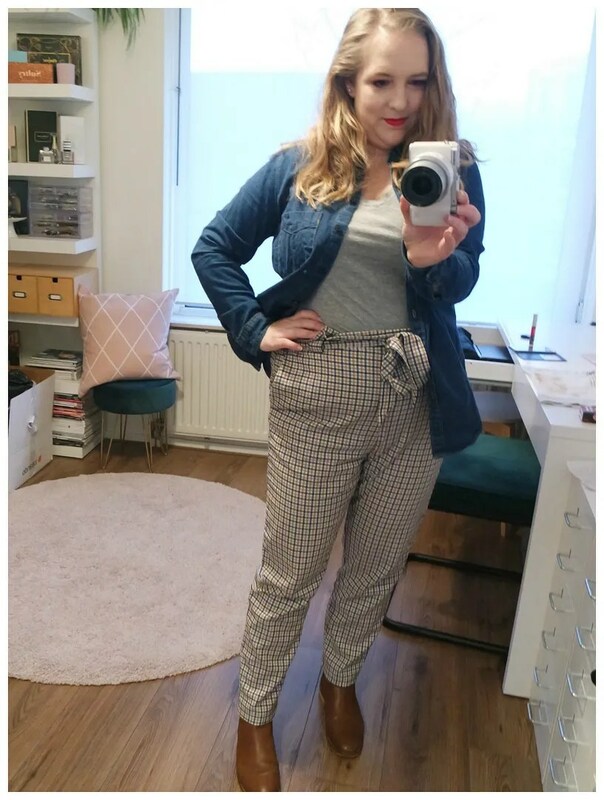 I wore this same pair of trousers the day before with a navy, mock silk blouse and I liked that combination a lot better, but of course I forgot to take a picture. I quite liked this outfit too though, so I thought I’d share that instead. I love the check print of these trousers and it pairs well with navy, denim and my favorite pair spring Chelsea boots. 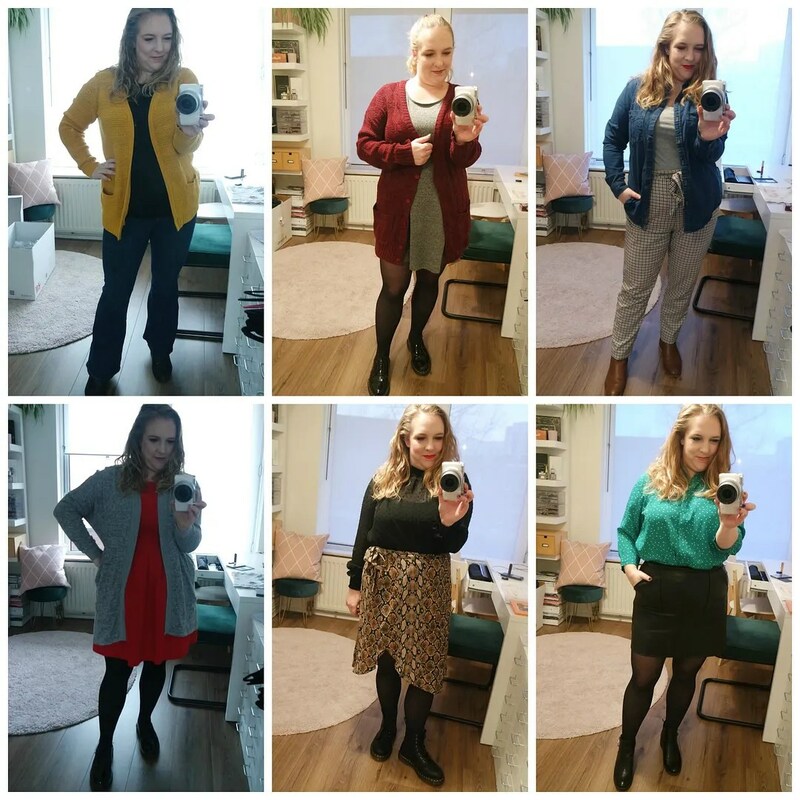 I’ve been wearing high-waisted distressed jeans from Uniqlo with ‘heat tech’ (thermals) tops from the same brand for months. Was unbearably cold where I am. I much prefer Autumn and Winter than Spring and Summer, but I’m looking forward to being able to wear blouses and not having to wear heavy jumpers 🙂 Btw, what is Urban Outfitters like for sizing in your opinion, is it accurate? We had a pretty mild winter. Only one or two weeks of snow, so it wasn’t too bad. I think UO runs a bit small if you are curvy like me. I generally size up in UO clothing. Thanks! I love inserting some color. Thanks! I really loved putting them together. My new favourite jeans are from Blue Ridge, a brand from the WE store. Classic somewhat bleached dye and thick fabric, not the thin stuff with polyester. High waist and tapered at the bottom. WE usually comes up too long on me :-(, but I love those flares too. Hoping the weather here is turning spring-y finally. I’ve definitely been feeling the winter blahs with my wardrobe lately. I am feeling ya! I love sweaters and always look forward to wearing them, but come spring time, I am always sick of them. Thankfully I live in a country with 4 seasons.